This project transformed an actual old bank vault into a wine cellar for private use. Nicolai proposed a 'Trompe L'Oeil' Gold Rush Era theme. 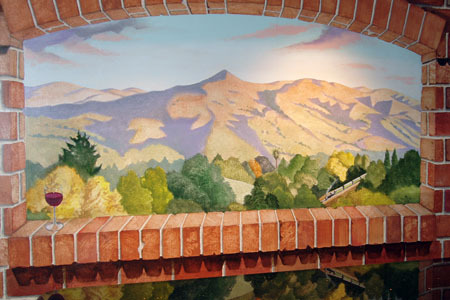 Painted brickwork with windows looking out on the East Bay Hills enlarge the small enclosed interior of the vault. Once inside the vault the viewer is in a completely painted environment like a jeweled box with landscape vistas. Location: Fremont Bank Historical Building, Niles District, Fremont CA. Specifics: 352 square feet of walls painted with acrylics. Painted Safe and Faux Gold Bullion Depository. Executed in 2004-2005. Black Granite Counters, Cherry Wood Appointments, Metal Grates, Wine Racks.